Dr. Folefac Aminkeng is a Postdoctoral Fellow at The Centre for Molecular Medicine and Therapeutics (CMMT) at the University of British Columbia in Vancouver, BC, Canada. He utilizes GWAS studies to identify single-nucleotide polymorphisms (SNPs) that might be associated with serious adverse drug reactions (ADRs) in cancer therapeutics. The field of pharmacogenomics and how one's genetic makeup affects drug response has grown exponentially over the past decade. With this exponential growth, there has been a corresponding increase in dataset size. Working with a huge number of variants is now commonplace in the pharmacogenomics field, and open-source programs are often unable to handle such large datasets. Thus for Aminkeng, the use of SNP & Variation Suite (SVS) is vital for efficient and meaningful analyses of such large datasets. "For me, SVS has become a daily tool," says Aminkeng. With SVS, he has seen a tremendous improvement in terms of the speed with which projects are completed. Likewise, SVS has saved costs. "Time is money," says Aminkeng. While following the progress of the Human Genome Project (completed in 2003), Aminkeng became fascinated with the idea that genetics and genomics were going to change the world. 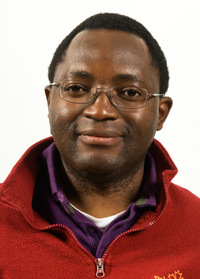 After completing his undergraduate studies in Cameroon, Aminkeng earned his PhD in human and molecular genetics at the Free University in Brussels, Belgium. Part of his dream was to be in a cutting-edge lab where he could develop tools that use genetic factors to optimize the treatment of disease for each individual. Since early 2011, Aminkeng has been at CMMT where he has been working on the pharmacogenomics of ADRs in cancer therapeutics. With any drug, some individuals will respond normally, others will not respond at all, and some people will develop very serious, often fatal, adverse reactions. Dr. Aminkeng is most interested in this last group. "We are particularly interested in being able to predict which patients will develop adverse events," says Aminkeng. "The goal is to develop tests based on genetic markers so that cancer drugs are safe for everyone." The hope is that physicians will know up front if a patient will have an adverse response to a drug, and thus take appropriate measures within the current guidelines and standards of care. At CMMT, Aminkeng is specifically affiliated with The Canadian Pharmacogenomics Network for Drug Safety (CPNDS), a nation-wide active drug surveillance and pharmacogenomics consortium aimed at identifying novel predictive genetic markers for ADRs in children and adults. The surveillance arm of the CPNDS identifies patients with relevant ADRs and match controls and collects biological samples. Aminkeng's group then processes the samples and performs the genomic analyses. Dr. Aminkeng's project has a sample size of 500-600 individuals and involves a 700,000 SNP GWAS panel. With a large sample size and an even larger number of variants, SVS is indispensable for getting meaningful results from the data. "SVS is a much more powerful tool compared to open-source software for large datasets," says Aminkeng. Within Aminkeng's team, there are currently 4-6 people using SVS. As more projects are added in the coming months, he expects many more people will be using the software. As a result, having good quality-control measures along with an ability to combine datasets seamlessly are of the utmost importance. The quality-control and data management features of SVS are routinely used by Aminkeng. According to him, the ability of SVS to combine datasets accurately, particularly from different formats, surpasses that of other software packages. For Aminkeng, one of the most valuable assets of SVS is its time-saving ability. With SVS, users can get meaningful results fast, and according to him, most of the required analysis tools are already included. If a specialized tool is needed, the Golden Helix support team develops one quickly. "The support team is always fast, efficient, and accessible," says Aminkeng. "When you have a question or a problem, someone is always immediately there and ready to help." Aminkeng hopes to get several high impact publications within the next two to three years using SVS on this project. He hopes his findings will have a major impact on clinical practice within the field of pharmacogenomics of ADRs. Such productivity would be unthinkable without SVS. In terms of efficiency, productivity, meeting critical deadlines, and staying ahead of others in the field, "There is definitely a big difference between having SVS and not having it!" says Aminkeng.